Kristi Roberts Havard, daughter of former Lee College instructor and Texas State Rep. Ron Roberts, combs through the photo archive at the Lee College Library in search of images of her father. The library is giving away extra copies of college photos taken from 1970-2005 for free to the community. 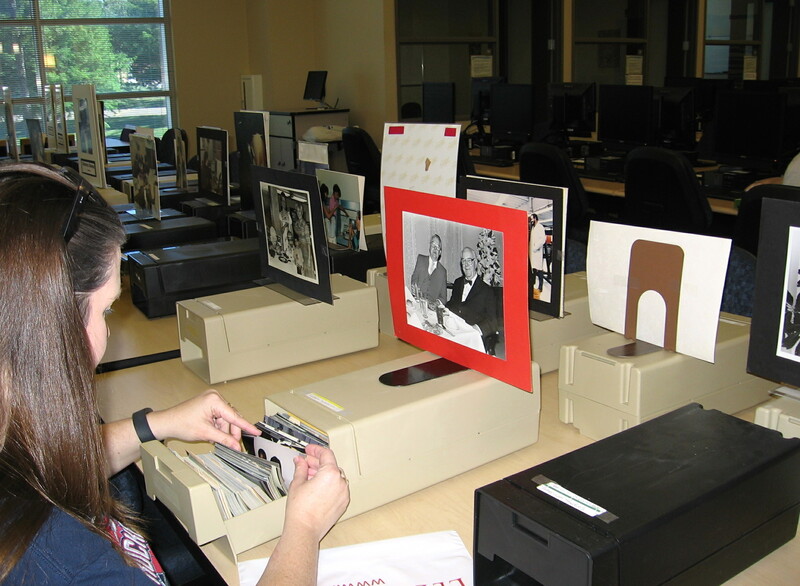 BAYTOWN, TX — After opening up its archive of photos documenting interesting people, organizations and events from Lee College history, the Lee College Library invites members of the community to campus next week to browse the collection and take copies of any photos they like for free. Extra copies of photos from 1970-2005 will be available for viewing and collecting May 15-19 near the reference desk during regular library hours. The library is open from 7:30 a.m.-7 p.m., Monday through Thursday, and from 7:30 a.m.-12:30 p.m. on Friday. Participants are welcome to take as many photos as they can carry. Photos included in the free archive are arranged by department and include shots from athletics, the campus, events, faculty, fine arts, nursing, students and technical studies through the years. For more information about the giveaway event, contact the library at 281.425.6379.